Also, Haydn: Symphony No. 88. 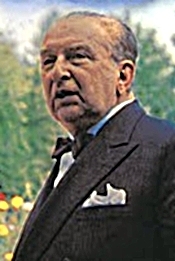 Fritz Reiner, Chicago Symphony Orchestra. HDTT HQCD313. Among the first conductors I remember liking on LP in the early Sixties when I started collecting classical music recordings seriously was Fritz Reiner, who in the early Fifties took over the Chicago Symphony Orchestra just a year or so before the dawn of the home-stereo revolution. He only made stereo recordings in Chicago from 1954 until just before his death in 1963, but they remain for me among the best recordings of all time. That’s why it came as a surprise to find that HDTT (High Definition Tape Transfers) had transferred to disc two recordings I didn’t even know Reiner had done, let alone had I heard, Mozart’s Symphony No. 41 and Haydn’s Symphony No. 88. Of course, not everyone likes Reiner the way I do; he definitely falls into the special-taste category. His insistence on strict orchestral discipline and musical precision results for some listeners in performances that may sound too sterile, too controlled. Not for me. I’ve always thought he brought out the best in any score he essayed, giving it a polish and control that allowed the music itself to bloom more fully. Such is the case with these two recordings. The more important of the two is the crowning jewel in Mozart’s symphonic output, Symphony No. 41 in C major, K. 551, “Jupiter,” Mozart’s final and longest symphony, which he wrote 1788, just three years before he died. Interestingly, scholars are unsure whether Mozart even got the chance to hear it in his lifetime, yet it remains one of the glories of the symphonic canon. Understand, Reiner’s is not an interpretation one might mistake for a period-instrument or historical approach, except in one regard. Reiner practically attacks the opening Allegro vivace, putting the emphasis on the direction "vivace," as in lively or brisk. This is, indeed, lively and brisk to the point where if the Chicago players were using period instruments and there were fewer of them, it would sound like a historical performance at least in matters of tempo. However, with the full force of the ensemble behind the playing this is clearly a traditional rendering of the symphony. And so it goes throughout the work, with Reiner carefully observing Mozart's notations and making not just a grand statement but a fully invigorating one, too. Not that all listeners are going to respond to it, however. The reading hasn't the monumental lines of Klemperer's rendition, the graceful refinement of Bohm's, the classical energy of Bernstein's, or the sheer joy of Jochum's. Instead, we get the rigidly direct phrasing for which people have come to expect from a Reiner interpretation. Nevertheless, the Largo still sings beautifully, the Minuet still dances merrily along, and the Finale retains all the zest, spirit, and vitality one could ask for, one of the best on record. Even though this may be a go-for-the-throat reading of the "Jupiter," it's one of the most-exciting, most-thrilling, and yet most-moving "Jupiters" you'll find anywhere. Coupled with the “Jupiter” is Haydn’s Symphony No. 88, written in 1787, a year before Mozart’s masterpiece. It’s further interesting to note that the older Haydn, one of Mozart’s inspirations, would continue writing music for close to two decades after Mozart’s death; yet Mozart clearly surpassed his mentor before his passing. What could Mozart have accomplished if he hadn’t died so relatively young? One can only wonder in frustration. Anyway, Reiner handles the Haydn piece as he did the Mozart, with an exactitude and authority some listeners, including me to some degree, might resist. Given that Haydn would eventually produce 104 symphonies, it's remarkable that he was able to infuse each of them with such originality, keeping them all quite different from one another. Now, I'm not suggesting I could possibly tell any of the early symphonies, especially, from one another, but if you listen to them consecutively as I once did (on Antal Dorati's complete set), they do sound different from one to the next. So, expect in No. 88 some surprises. Although I have to admit that Reiner can’t quite match a Beecham or a Jochum for cheerfulness and charm in a Haydn symphony, I do find Reiner’s slightly more analytical approach fresh and, in its own way, maybe not entirely satisfying but affectionate. 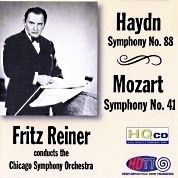 RCA producer Richard Mohr and engineer Lewis Layton recorded both symphonies in Orchestra Hall, Chicago, the Mozart in 1956 and the Haydn in 1960. HDTT remastered the music from 2-track stereo tapes and burned it to an HQCD. You’ll remember that in the early days of home stereo it was RCA and Mercury who were doing some of the best, most-realistic recordings, with RCA’s team of Mohr and Layton among those in the forefront. That doesn’t mean everybody likes what they were doing; some people find RCA’s early stereo too wide, but I’ve never agreed. While they can sometimes have a sort of hole-in-the-middle effect, at least on some playback systems, these occasions have been rare in my experience. What I generally hear is wide, true, but faithfully wide, wide as in what a person might actually hear at a live event from a moderately close, but not too close, center row distance. That’s the way the orchestra sounds here. The sonics are about as good in both symphonies as anything being recorded today. More important, the sound HDTT reproduces here is wide in breadth and wide-ranging in frequency response and dynamic range, perhaps a touch more transparent in the Haydn. It also displays plenty of orchestral depth, solid bite and impact, and a fine sense of hall ambience. In other words, it sounds real. What's more, it sounds better than any of RCA's own remasterings of Reiner's other Chicago performances to which I compared it, fuller, rounder, and smoother.